(Courtesy U.S. Air Force | MSgt. Christopher Boitz ) Maj. Stephen Del Bagno was killed when his aircraft crashed during a practice aerial demonstration on April 4, 2018. 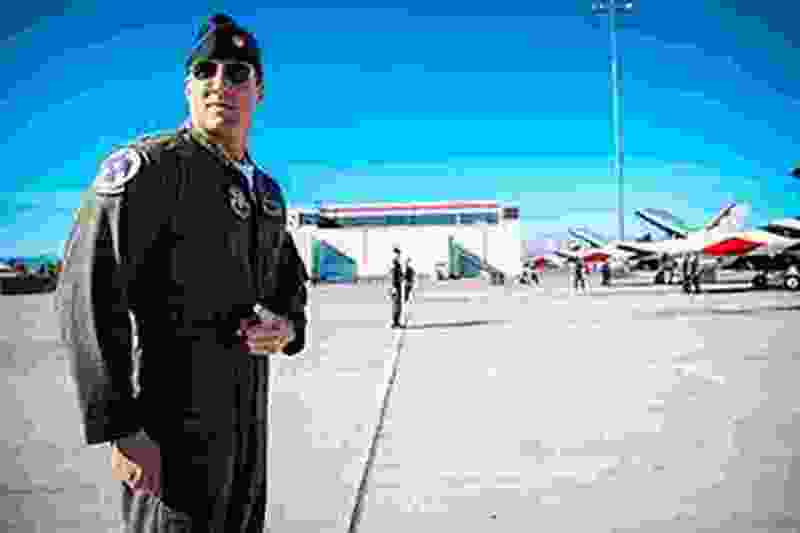 A U.S. Air Force pilot and Utah Valley alumnus, killed last year in a crash while practicing for the Thunderbirds precision flight team, has received a unique honor: Having the new Marvel movie dedicated to him. Del Bagno, 34, died April 3, 2018, when his F-16 Fighting Falcon crashed in the Nevada Test and Firing Range north of Nellis Air Force Base, outside Las Vegas. Del Bagno graduated in 2005 from Utah Valley State College, now Utah Valley University, in Orem. Before joining the Air Force, he was a civilian flight instructor and banner tow pilot. Brie Larson, the star of “Captain Marvel,” visited Nellis to research her role — Captain Marvel’s alter ego is Carol Danvers, an Air Force pilot — and met Del Bagno and other Thunderbirds pilots. The post included a photo of Del Bagno and Larson on a runway, both wearing flight suits and aviator sunglasses. Larson referred to Del Bagno by his call sign, Cajun, and added that “I hold the call sign you gave me with your fellow pilots and Thunderbird brothers with pride.” She ended the post with what appeared to be her call sign, “Sparrow, forever” and a broken-heart emoji.